It’s probably because I’m from Idaho, but I do indeed love potatoes. Especially with breakfast. In fact, I’d say that hash-browns and home fries are my favorite breakfast foods…er, vices. 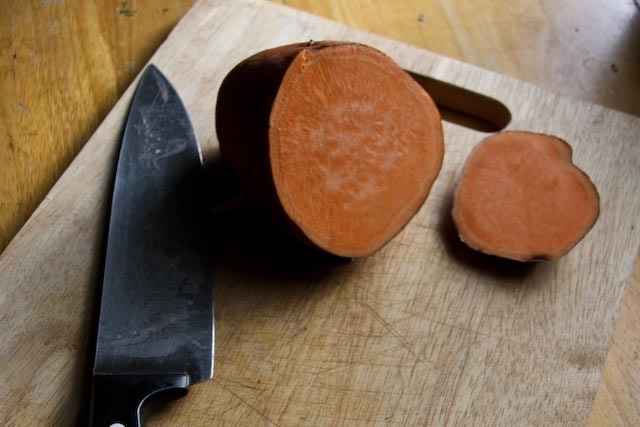 Even better if they’re sweet potatoes, the healthy super-star of the potato family. These babies pack tons of vitamins and nutrients, and they’re quite high in fiber and delicious to boot! Yes sir, I love me some potatoes for breakfast. 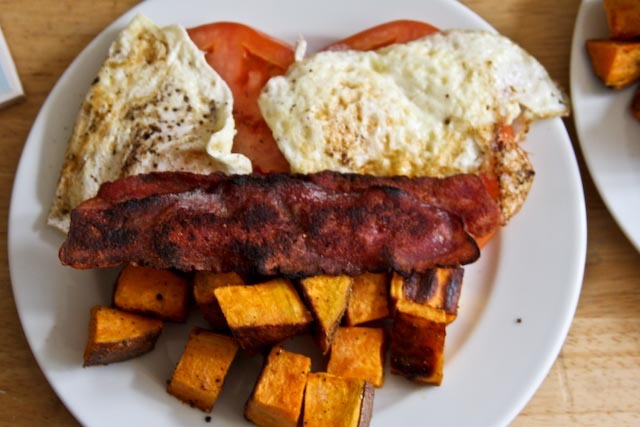 These sweet potato home fries are a quick, easy, and flavorful addition to any weekend breakfast. I seasoned these with black pepper, Adobo, and a little bit of both sweet and spicy (super hot!) 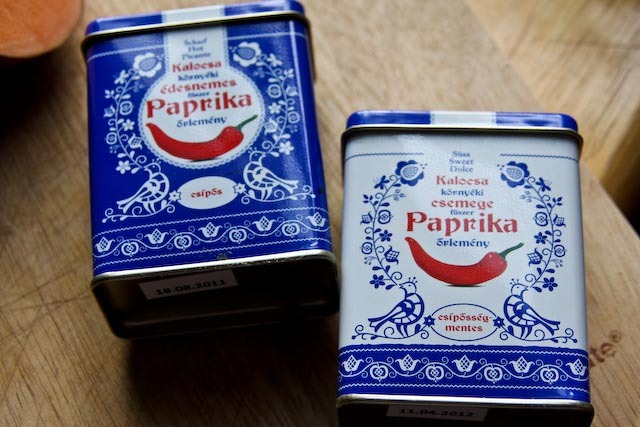 paprika that I bought in Budapest when I was there (you could easily use regular paprika, cayenne pepper, or any other favorite spices to jazz up these home fries). These potatoes are also great as a side dish for any dinner or brunch as well. I hope you enjoy them as much as I did! Preheat oven to 400°F. 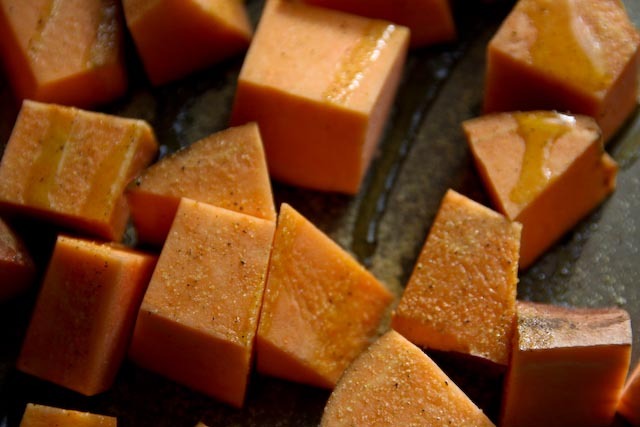 Place cubed sweet potatoes on a baking sheet. Drizzle with olive oil and sprinkle with pinch of each of the spices. 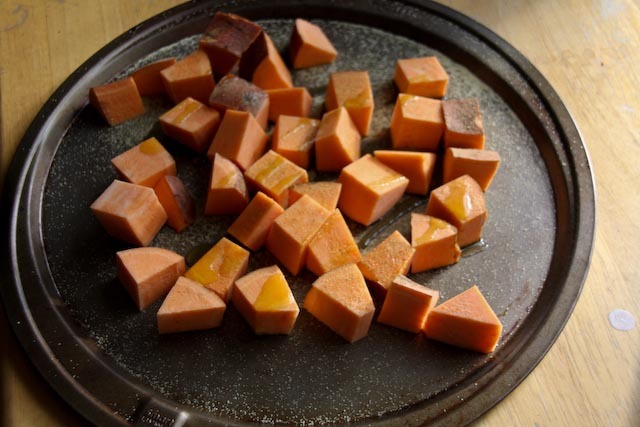 Using your hands, toss the sweet potatoes to be sure that all sides are coated with a bit of oil and spices. Bake for approximately 20 minutes, or until the potatoes can be easily pricked with a fork. Serving size is approximately 1 cup.